Leading Manufacturer of pig feed machine and pig feed plant from Delhi. We hold expertise in offering a wide range of Pig Feed Machine. Offered by us in the market at a very reasonable rate, this product has a high demand in the market. All the machine are being fitted on the ground level. We are the leading manufacturer and supplier of Pig Feed Plant. In addition to this, the modular structure is containerized and it assures convenient assembly and dismantle of the machinery. By the time product and air pass each other, they exchange heat moisture. Basic raw-material ingredients are manually dumped into the under-ground pocket in which Bucket Elevator-I is fixed. The above Bucket Elevator will automatically lift the raw-material ingredients from the under-ground pocket and feed the same into the hopper of Hammer Mill (Grinder). The Grinder will grind the raw-material ingredients to required mesh size and the ground material coming out of the Grinder out-let hopper will fall into another under-ground pocket in which Bucket Elevator-II is fixed. 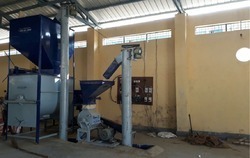 Looking for Pig Feed Machine & Plant ?